Police are catching more drivers speeding on roads in South Yorkshire, new data reveals. South Yorkshire Police detected 47,811 speeding drivers between April 2017 and March 2018, 16 per cent more than in the previous year, a recent study carried out by the RAC Foundation shows. Nearly all the infractions in South Yorkshire were captured by speed cameras. South Yorkshire had a rate of 35 offences per 1,000 people. Across England and Wales, police caught 2.3 million drivers speeding over the year – a rate of 40 per 1,000. 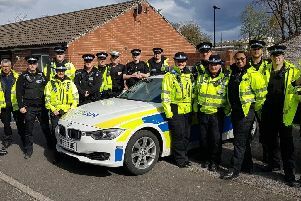 Of those offenders caught in 2018-17 by South Yorkshire Police, 55 per cent were offered the chance to take speed awareness courses. About 36 per cent were given a fine, compared to an average of 34 per cent for England and Wales. A further 6 per cent of the offences in South Yorkshire resulted in court action, while 3 per cent were cancelled. Provisional plans agreed by the EU mean that new cars sold in the UK from 2022 will have default devices which stop them breaking the speed limit. The Department for Transport said new rules would apply to the UK despite Brexit.